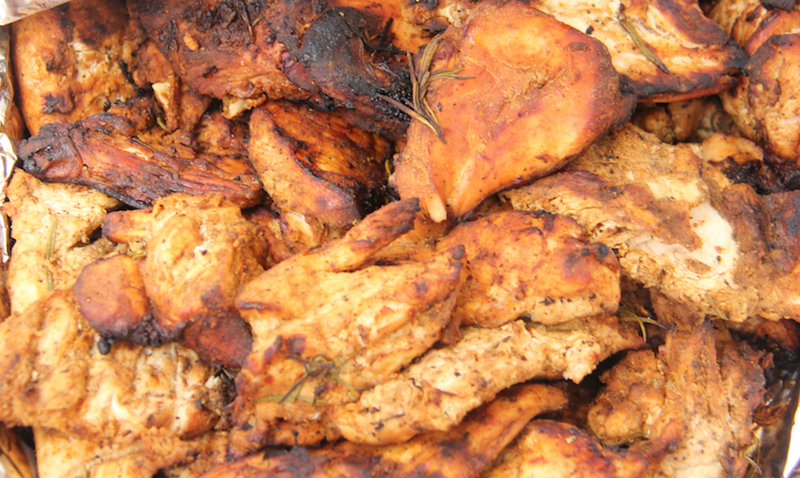 Thanks for the Memories… Slow Smoked Rosemary Chicken Breasts served at the Santa Monica Police Dept. 120th Anniversary BBQ. Prepared by Chef Mick Brown of Tastee BQ Grilling Co., Los Angeles. A little over a year ago a friend contacted me about this event I had never heard of. Called National Night Out, she wanted to know if I could contribute some food. What’s it all about? Since 1984, the National Association of Town Watch (NATW) has sponsored gatherings in over 16, 000 neighborhoods around the country. Along with community outreach with info about crime prevention, safety tips and helpful community programs, the gatherings usually include some sort of Cookout. In most cases, that means BBQ! With over 38 Million Members, the NATW also sponsors a national Dog Walkers Watch program to train the to make our neigh’s even safer. Partying in Santa Monica? Special Demo Car give you choice to go home in backseat of a Taxi of a Santa Monica Police Dept. vehicle. They also include a Memorial for Police Officers who were lost in the line of duty and donations to local Charities. More than ever, it is an important time to Communities to come together with the dedicated members of Law Enforcement who provide invaluable service for all of us every day. Based on recent events, a couple of Bad Eggs may have to be cracked (on both sides of the law). However, the vast majority of U.S. Citizens and Officers alike are out to do the right thing. We are all much stronger together, than to leave the streets in the hands of Outlaws. [With that said, I can put aside the Soapbox and we can get to the Food]. Chef Mick Brown helping serve lunch at the Santa Monica Police Dept. 120th Birthday BBQ. Last year I participated in the festival at The Greek Theatre in Griffith Park (Los Angeles). In between doling out slices of Smoked BBQ Pizzas from Cheech’s and samples of HEROIC! Rub, I also took the opportunity to launch my new project called BBQ RESCUES! At the time, I had been recently crowned Grill Master Champion on Food Network show Cutthroat Kitchen. It was fun to do interviews with several Police Reps, Community Volunteers and discovering this great A Cappella band called Jondo. Chef Mick Brown visits Pink’s Hot Dogs stand at the National Night Out 2015 at the Greek Theatre. This past May, I was honored to cater the 120th Anniversary Cookout for about 500 Officers and Staff of the Santa Monica Police Department. The event went great for the Tastee BQ Grilling Company. We were pleased to use HEROIC! Rub to grill some of our best Hot Links, Burgers and Smoked Chicken ever. Special Thanks to Kingsford Charcoal and Pit Barrel Cookers for contributing extra supplies for the event. Dunkin Donuts were also supplied the Police event with most of the most impressive Donut Stands we have ever seen. Also Thanks to the SMPD for providing photos and Ciao Bella for extra staffing help. Thanks to Ciao Bella Staffing for providing Tastee BQ Grilling with some extra help at the Santa Monica Police 120th Anniversary BBQ. I plan to release a Kingsford sponsored video for the Perfect Burger sometime before now and Labor Day. In the meantime, you can get mood for this years event by listening to last years podcast “National Night Out at the Greek (Parts 1 & 2)” with slideshows on the BBQ RESCUES! Blog Talk Radio website or download them on iTunes. There are also links to find the National Night Out event in your area. Finally, I couldn’t resist adding a couple of my favorite Youtube Videos of Policemen around the country dancing at recent BBQs. Enjoy. Until next time, Eat and Be Well. 2016 National Night Out, August 2 – Local Events – Los Angeles Police ..
AIRDATE January 16. 2016 12 Noon (PST) on Blog Talk Radio. Coming Soon to iTunes. 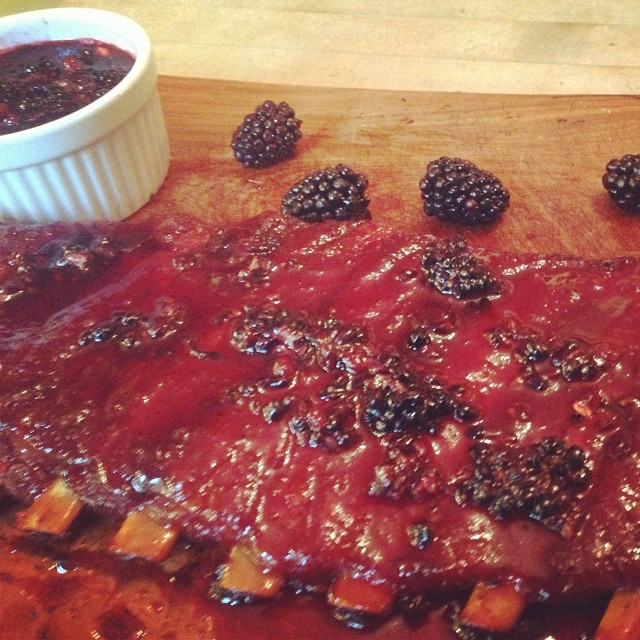 Raspberry Ribs Recipe by Chef Randy Hill of Southern Krunk BBQ Society in Hot Springs, Arkansas. Fire Up the New Year and for an even Happier 2016! Introducing a New and Improved format for BBQ RESCUES! with Chef Mick Brown from Los Angeles. Get ready for Game Day with new Recipes. Feel feel to call in and share your favorite go-to BBQ Dishes for game days. Phone lines will open up at 12:00 Noon (PST)/ 3:00 pm (EST). Also on tap, How to Reach Your Goals for 2016- on and off the Grill. Special Guest is Grill Master Extraordinaire, Chef Randy Hill, from Southern Krunk BBQ in Hot Springs, Arkansas. Tell us what you think about New School BBQ and/or any other New Trends for 2016.